French: Martin-chasseur mignon; German: Wellenliest; Spanish: Martin Cazador Chico. 8 in (20 cm), no mass data. Medium-sized kingfisher with back and tail banded in black. Sexes differently colored, male with crown and back metallic blue, forehead and mask rufous or black and pale buff below, female reddish brown above and white below with fine black banding extending over head and across breast. Both sexes with red bill, one of few kingfishers with pale, yellow-brown iris. 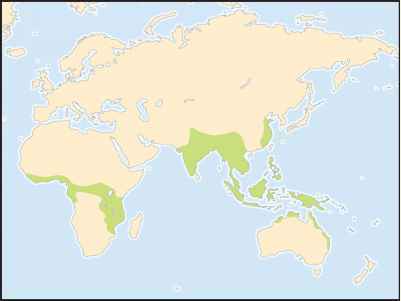 Myanmar, Thailand, and Sunda region of Borneo, Sumatra, and Java. Lowland evergreen and bamboo forest, extending to 5,600 ft (1,700 m) above sea level on hill forests of Borneo. Perches motionless for long periods, except to slowly raise and lower long crown feathers, at various heights in the forest. Members of pair territorial, often perched in close proximity to one another. Call with single long whistle, followed by long series of short tri- and di-syllabic whistles. Forages in diverse ways, swooping to the ground, onto fallen trees or into water, probing in loose soil, or snatching off foliage. Diet also diverse, a wide variety of arthropods and small vertebrates. Excavate nest cavity in rotten wood, earth bank or arboreal termite nest. Lays two to five eggs. No further details recorded. Not threatened. Widespread and common in many areas of unlogged forest, including large conservation reserves. Easily overlooked unless calling.